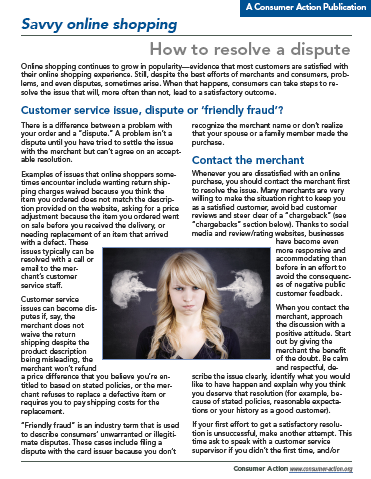 Consumers who shop online sometimes run into problems, from delivery or product issues to billing questions or disputes. This publication explains the steps that online shoppers can take to avoid or resolve these and other problems that might arise. Customer service issue, dispute or ‘friendly fraud’? Online shopping continues to grow in popularity—evidence that most customers are satisfied with their online shopping experience. Still, despite the best efforts of merchants and consumers, problems, and even disputes, sometimes arise. When that happens, consumers can take steps to resolve the issue that will, more often than not, lead to a satisfactory outcome. There is a difference between a problem with your order and a “dispute.” A problem isn’t a dispute until you have tried to settle the issue with the merchant but can’t agree on an acceptable resolution. Examples of issues that online shoppers sometimes encounter include wanting return shipping charges waived because you think the item you ordered does not match the description provided on the website, asking for a price adjustment because the item you ordered went on sale before you received the delivery, or needing replacement of an item that arrived with a defect. These issues typically can be resolved with a call or email to the merchant’s customer service staff. Customer service issues can become disputes if, say, the merchant does not waive the return shipping despite the product description being misleading, the merchant won’t refund a price difference that you believe you’re entitled to based on stated policies, or the merchant refuses to replace a defective item or requires you to pay shipping costs for the replacement. “Friendly fraud” is an industry term that is used to describe consumers’ unwarranted or illegitimate disputes. These cases include filing a dispute with the card issuer because you don’t recognize the merchant name or don’t realize that your spouse or a family member made the purchase. Whenever you are dissatisfied with an online purchase, you should contact the merchant first to resolve the issue. Many merchants are very willing to make the situation right to keep you as a satisfied customer, avoid bad customer reviews and steer clear of a “chargeback” (see “chargebacks” section below). Thanks to social media and review/rating websites, businesses have become even more responsive and accommodating than before in an effort to avoid the consequences of negative public customer feedback. When you contact the merchant, approach the discussion with a positive attitude. Start out by giving the merchant the benefit of the doubt. Be calm and respectful, describe the issue clearly, identify what you would like to have happen and explain why you think you deserve that resolution (for example, because of stated policies, reasonable expectations or your history as a good customer). If your first effort to get a satisfactory resolution is unsuccessful, make another attempt. This time ask to speak with a customer service supervisor if you didn’t the first time, and/or put your request in writing (and keep a copy). If, after at least two attempts, you have tried your best to resolve the issue directly with the merchant and still are unsatisfied, it may be time to escalate. One option you might have is to enlist the help of an online mediator. These services intervene in a customer/merchant dispute, assisting the parties to negotiate an agreement. There typically are advantages for all parties—convenience and resolution for consumers, satisfied customers and lower bank fees for the merchant. Availability, cost and processes vary, but the services, offered both by online mediation companies and by some payment processors, auction sites and large online retailers, typically are free or low cost. Consumers report that 81 percent of illegitimate disputes, or “friendly fraud,” are filed out of convenience. Moreover, only 14 percent of customers contact the merchant before disputing a purchase with the bank. If convenience is what you seek, a third-party mediator might be worth considering. As a last resort, you can file a dispute with your card issuer (if you used a credit, prepaid or debit card to pay) or the payment processor you used (such as PayPal). Different payment methods provide different dispute rights and requirements. You can learn more by contacting the card issuer or payment processor. The dispute process will start with your request and an explanation of the situation (what the problem is, what efforts you’ve made to resolve it and the merchant’s response, and what resolution you are looking for). Under the Fair Credit Billing Act, credit card users have the right to withhold payment of the purchase amount while the card issuer investigates the dispute. (You should not be charged interest on the purchase while your dispute is pending.) This is one reason why it’s wise to pay for online purchases with a credit card. The outcome of the dispute process could be a permanent credit to your account for all or part of the purchase price if you win the dispute (called a “chargeback”), or a temporary credit to your account during the investigation, with the charge eventually being reinstated if you lose the dispute. Many disputed charges are actually legitimate transactions made by a spouse or other family member on a cardholder’s account. Because the cardholder didn’t make the charge and doesn’t recognize it when it appears on the card or bank statement, he or she believes it is fraudulent or an error. A great deal of time and expense can be avoided by checking with family members or anyone else with access to the account to find out if they made a purchase you are unaware of—before contacting the merchant or filing a dispute. “Chargeback” is the industry term for a bank or credit card company reversing a sales transaction (taking back the money it paid the merchant). Chargebacks are undesirable to merchants because they increase their cost of doing business. In addition to potentially losing the sale, penalty and processing fees are assessed for each chargeback. Chargebacks also are time-consuming to deal with. And a merchant receiving a high number of chargebacks could face additional charges from the card processor. In the worst-case scenario, the business could be labeled as fraudulent (even if that is not accurate) or lose its ability to process card payments—a mortal blow for any online business. While credit card dispute rights are a valuable consumer tool against fraud, the chargeback process is intended to be used when you are unable to resolve an issue with a merchant directly. In fairness to a legitimate merchant, filing a dispute with the credit card company shouldn’t be the first route taken when a non-fraud-related issue arises. Even if the repercussions for the merchant are not your primary concern, the process of disputing a charge can be time-consuming for you. A record of excessive disputes that indicate possible cardholder fraud could lead to a loss of your credit card account. Chargebacks increase overhead costs for merchants and this can mean that consumers pay higher prices for goods and services. Excessive returns, even if they are not disputes filed with the credit card company, could cause you to be added to a database that alerts subscribing retailers and may prevent you from making future returns. The Retail Equation, a specialty consumer reporting agency, alerts its large retail members about consumers’ product return patterns in order to help stores prevent fraud. (You can request your return activity report for free, if one exists on you.) Another potential consequence of excessive returns is being “blacklisted”—banned from shopping with that merchant again.